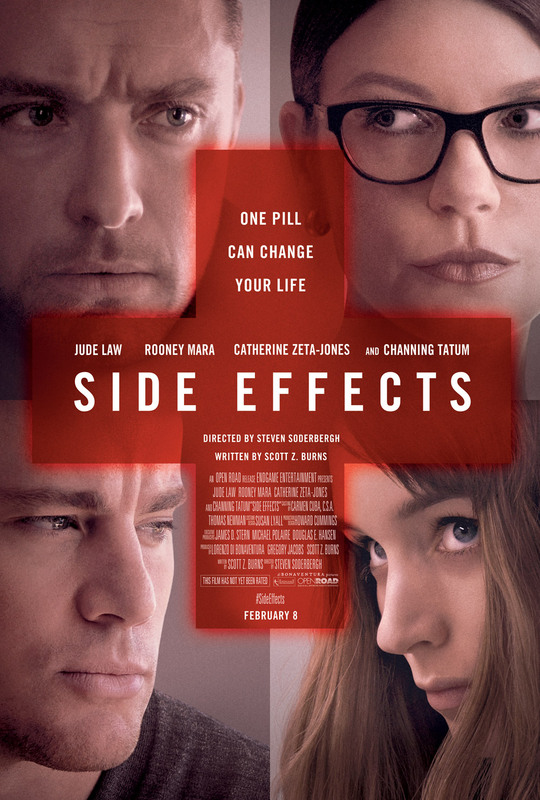 I was having anxiety about seeing “Side Effects”, as I wanted it to be more than the Lifetime Movie version of people with problems and how they solve them with pills. And director Steven Soderbergh (Ocean’s Eleven) delivered. Cue the pharmaceutical commercial music, and get those people out of the bath tubs. Poor little Emily, played perfectly by Rooney Mara (The Girl With The Dragon Tattoo) is depressed, and being married to Channing Tatum (Magic Mike) does not make her happy anymore. Maybe pills will help. Luckily, Dr. Banks (Jude Law, Sherlock Holmes) deals them out from his hip-mounted Pez dispenser while actually citing the cliché “better living through chemistry.” This movie does expose the culture of prescription happiness, and blames the patient, doctor, and the drug maker. While these pills solve one problem, they cause another. Poor Emily starts walking in her sleep, and then cooking dinner and then – ouch! I used to walk in my sleep, and my wife fixed it by putting a vacuum in my hands. I don’t want to give it away, but Emily does something really bad, like forgetting the fabric softener but much worse. She has to go away to what I like call a “Cuckoo’s Nest.” Seems they have to bring back her old doctor, played by Catherine Zeta-Jones (Ocean’s Twelve), to find out what is really wrong with her. I must say, that if Zeta-Jones told me to take a pill or commit stock fraud, I would do it, and there is not a male jury in this country that would convict me. As for Emily, I don’t want to tell you what happens, because I am still figuring it out. I found “Side Effects” to be well done with some nice acting and good characters that are all flawed in their own peculiar way. I still left the theater wanting — wanting Big Chief to pull that fountain out of the shower room, toss it through the window and run off into the sunset. Just rent “One Flew Over The Cuckoo’s Nest” and you will understand. “Side Effects” was satisfying, but in the way a cookie is satisfying when you really want a fudge brownie. The moral of the story, I guess, is when you put pills and pretty girls together, you wind up doing things you normally would not do. For me it’s vacuuming, night sweats, and shared deserts. For Emily, there are other side effects. I give this movie 3 out of 5 stars, so take a bag of popcorn and call me in the morning.